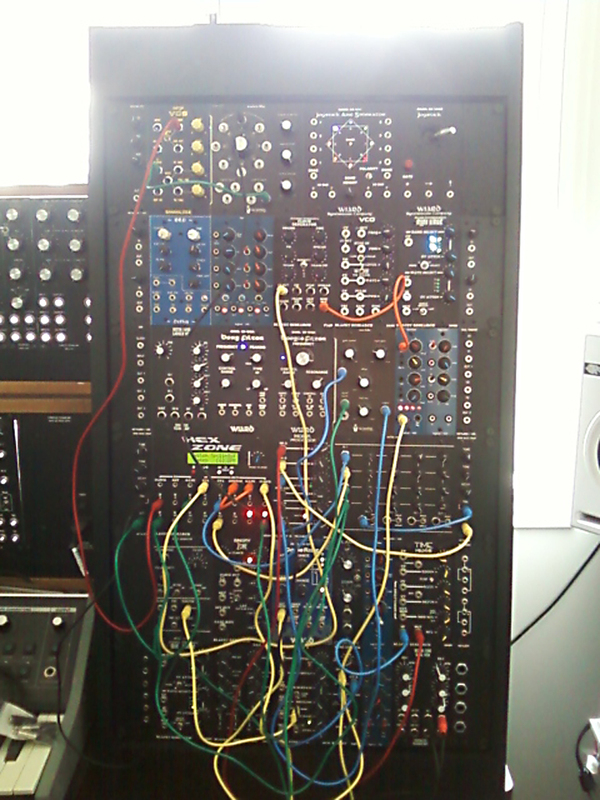 I think the reason that this system continues to grow is that I enjoy patching on it so much. My journey began in October of 2009 when I met Mike (Muff) in a Tim Horton's parking lot to trade my Future Retro Revolution for some Frac modules. Very soon after I added a VCS and a Plague Bearer. Within three months I was moving to three racks. In February of 2010 I had my first opportunity to feed my Wiard lust. I think I thought I was going to stop there, but a Noise Ring and Borg soon followed along with some other utility modules like a Window Comp and I/O. Over the next couple of years I would continue to add interesting things that came up in the B/S/T. I also had Mike at Metalbox make some custom ears. 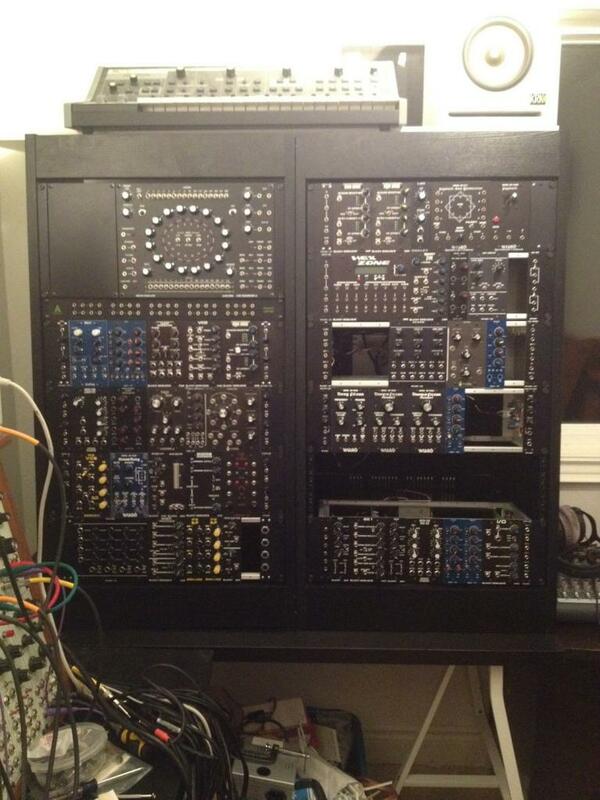 Here you can see 4 racks with my other modular stuff including the 2 Klees. One of them is built with minijacks. You may also noticed that I have sold the Zero and Saw animator by this time. I think the STG Mankato was the last module that filled up the 4th rack. I really thought I was going to stop here. But then I scored a second Borg and a pair of Boogies. Also the Cloud Generator, and a Time Machine. By then I was starting to get frustrated with with all the 500mA PSUs I was using and decided to move all of the Frac to a 18U cabinet with a single 2A supply courtesy of Graham Hinton. Then last Christmas I finally got some more BugBrand. 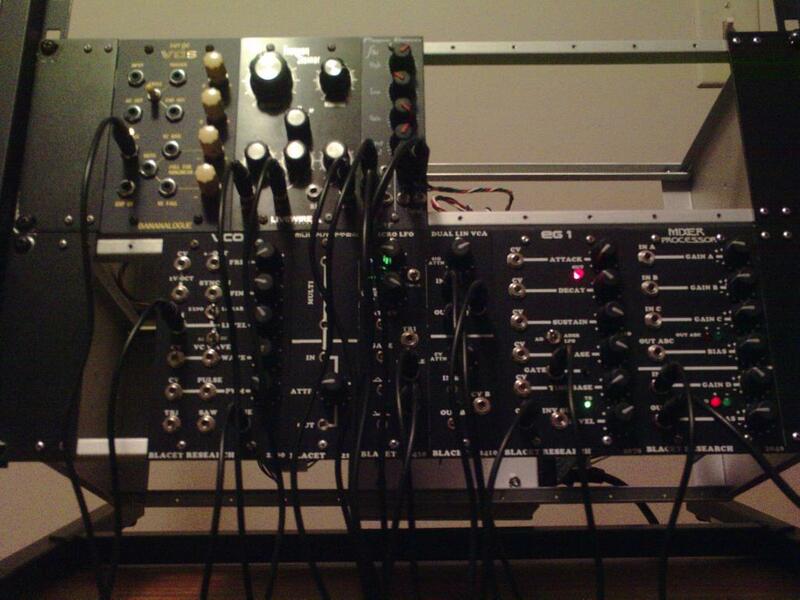 A very kind New York Wiggler hooked my up with a Wavefolder, BugCrusher, Weevil, LPG, SV Filter, and a VCA Drive. 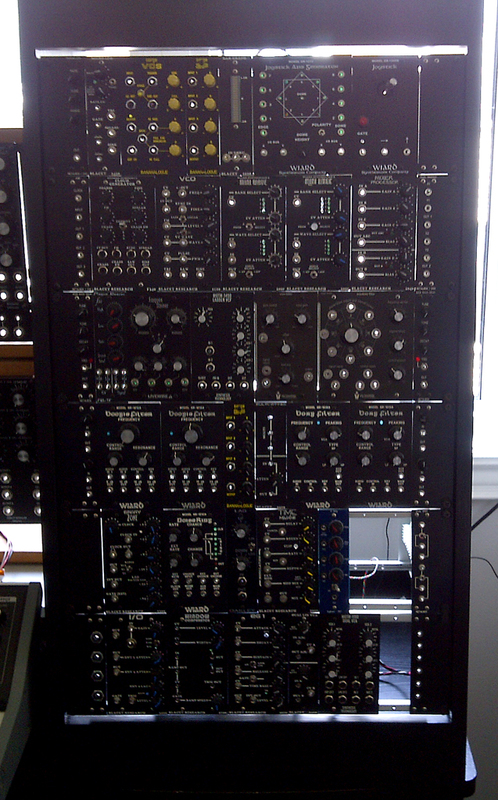 Also on display in this pic; The HexZone, a Matrix Mixer and a Burst Generator. 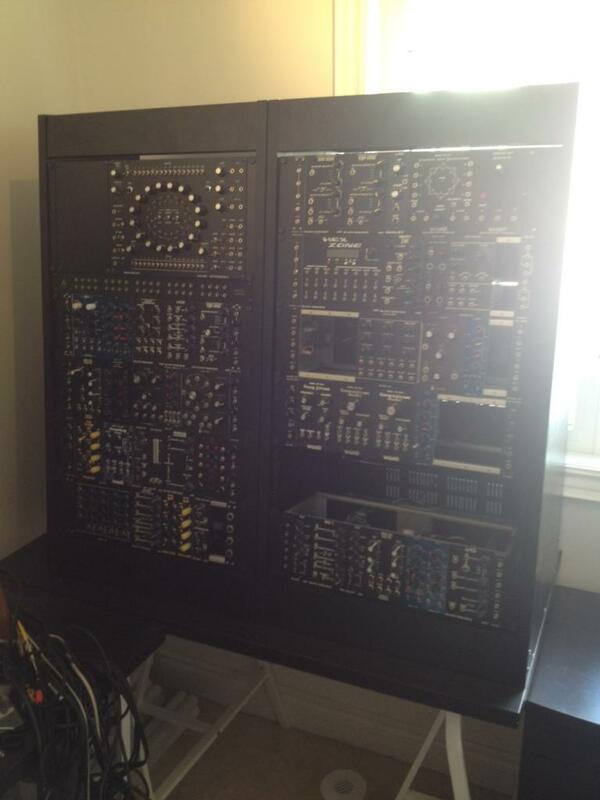 In the last couple of months I have picked up a Pair'o'Slopes, a CGS Wave Multiplier, some Synthcube stuff, and all the rails, panels, and hardware to add a second 18U cabinet. A second order of completed Frac ears is en route to me now from Metalbox, and an Encore Frequency Shifter should be hitting the post soon. I'm soooo excited. I'm on Vacation now until the end of the year, so I hope to have time to get the expansion up and running in the next couple weeks, so new pics to follow soon. It has been a real up and down ride, as I've been laid off twice over the course of this modular adventure, and came close to selling everything both times. sweet! im also an admitted frac addict. what is the blue module.. second row/first module on the left in the last pic? Awesome! I love frac as a format, I'm sorry to see most of mine go though I retain a fair large stake in bugfrac! Great to see my stuff going to happy homes! Great to see my stuff going to happy homes! One of the happiest Thanks! 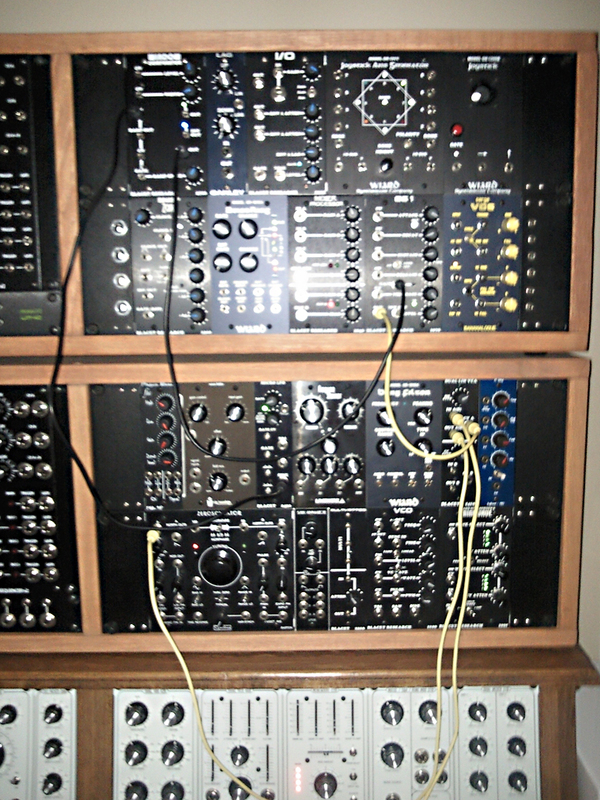 No, the other Boogie is in a box with a bunch of other modules that are side-lined until I can get the 2nd cab together. A big thanks to all of the wigglers who helped me get to this point including Muff, sandyb, haricots, consumed, D/A A/D, opsysbug, Norman Phay, kryptic, Babaluma, thetwlo, and any others I've missed. really cool to see the progression. that shot with the klees on top and modcan b below is tremendous. 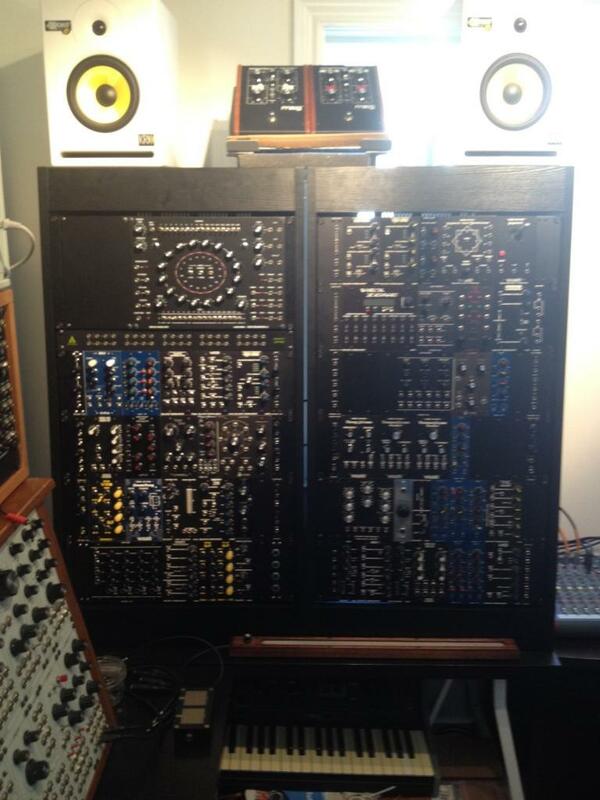 i loved the frac format as well, although im down to just one rack now. 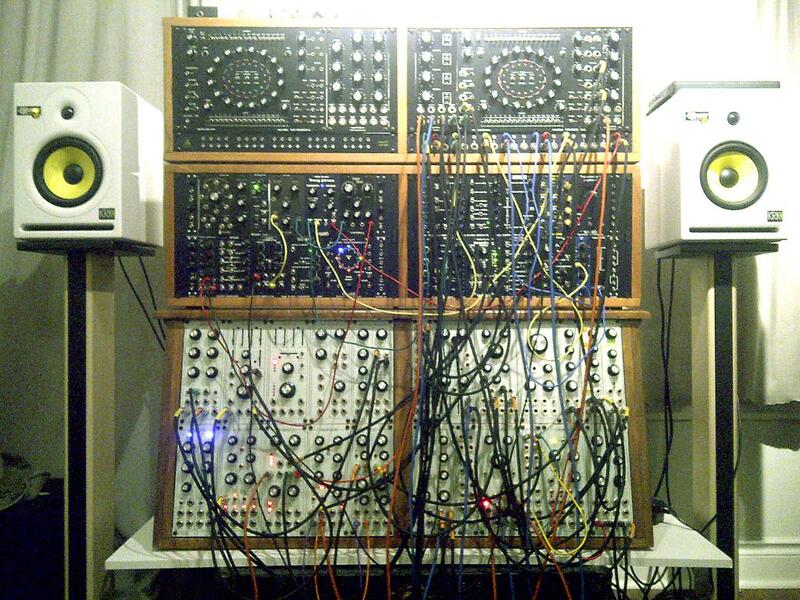 Definitely my favourite modular format. My new ears arrived in the mail yesterday! It's starting to come together !!! Man, I really need to take advantage of the Rack ear real estate! I like how convenient the pisser is there underneath the table....you almost never have to get up to do anything if there is a water supply module in there somewhere. 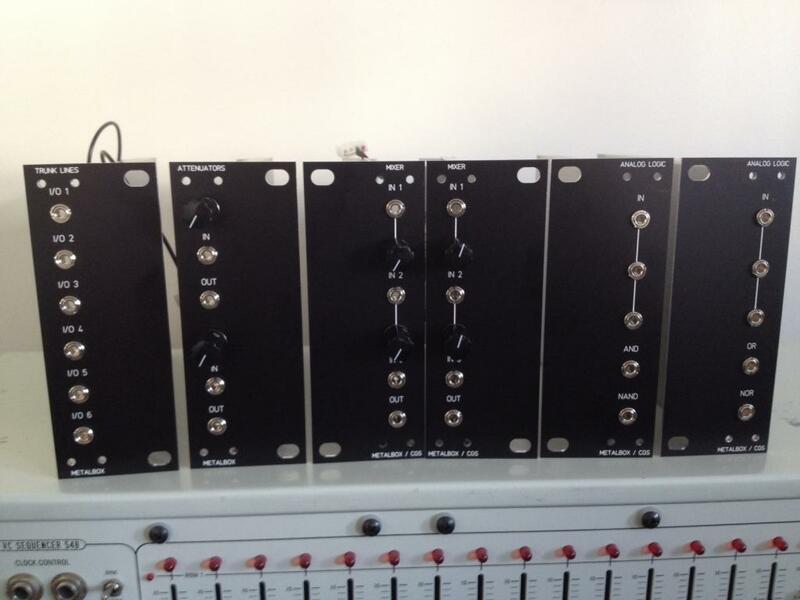 Livewire frequensteiner for frac!!!! Best filter ever!!!!! 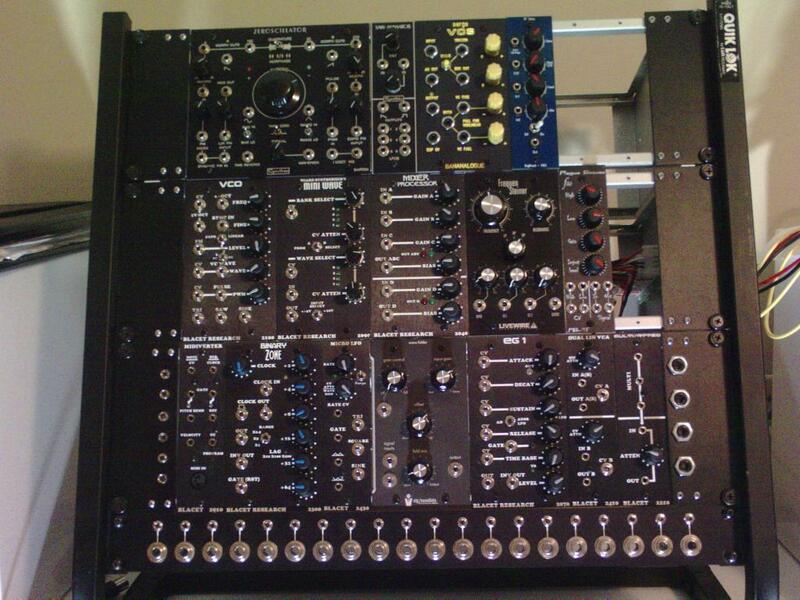 That Livewire Frequensteiner is the reason I have frac modules. If it hadn't been part of the system Muff was selling, I would never have started down this road. I wasn't expecting mail today, but it sure was a pleasant surprise! 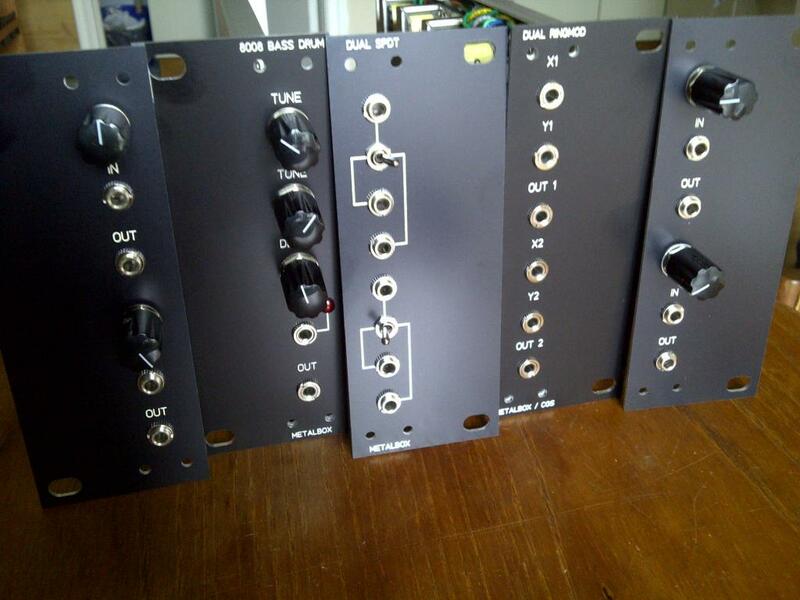 The last rack, and some blank panels arrived this morning, and the Encore Electronics Frequency Shifter arrived yesterday. 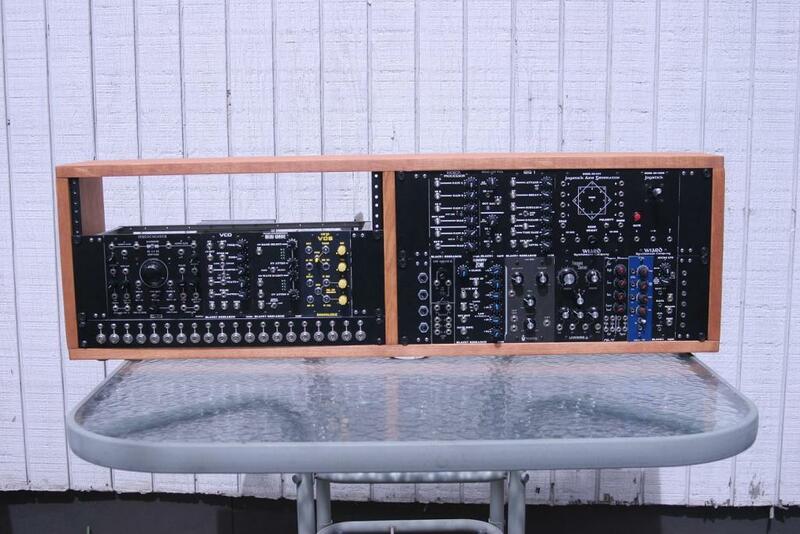 Plus a Klee Sequencer, and a 19" Mult Strip from A.I. 3 of those spaces will be filled by a 258J when Synthcube does a run of those. Time to go patch this bad boy! nice to see a healthy mature frac system. Seem to be getting rare these days? Overshadowed by the Euro format, methinks. I think, sadly, that is all too true. The frac offerings are starting to seem a little bland when compared to the glut of flashy esoteric modules on offer in Euroland. There are also many more new modules being released in Euro than in frac too. It seems like not a day goes by without another new Euro module being announced. I think there's also an element of many folks wanting as much possible functionality in the smallest possible (and sometimes impossible) space. The frac offerings are starting to seem a little bland when compared to the glut of flashy esoteric modules on offer in Euroland. There's certainly some truth to it. However, I'm sure many of the 'esoteric' functions could be achieved with Frac modules. For example audio FM, cross modulation, the audio in of the MiniWave will allow for a wide range of sounds and CV. I agree, however it seems these days that many people want to have a single module that does one specific function even though it could be achieved with a number of other modules. I'm guessing it's a space issue, the same reason behind the 2HP modules and the ever decreasing amount of space around controls and jacks on panels that have appeared over the years. Very nice rig. I've got about 15U now myself over the past couple of years. Great sounds and if you're patient and fast when it pops up frac can be had for tremendous value. I've got to talk to Metalbox about some ears. Some drums for sure. Maybe some logic as well. 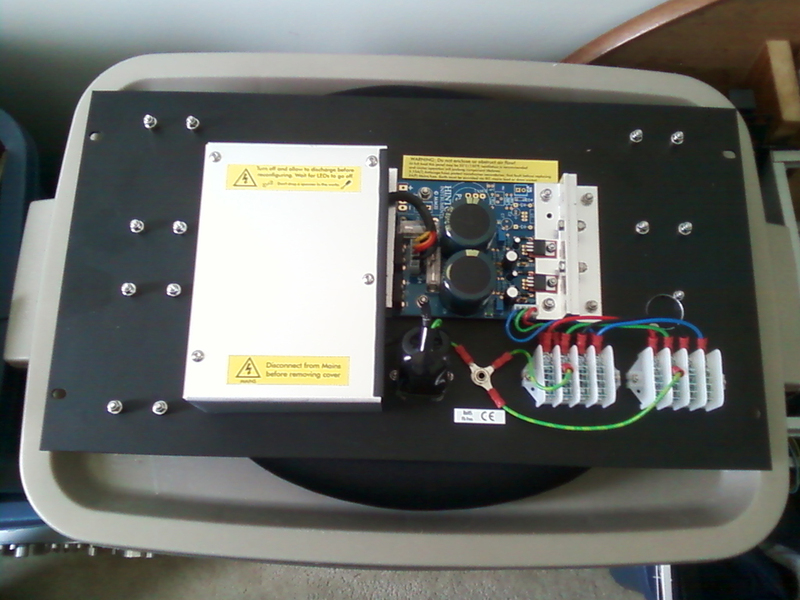 Have enough mults and attenuation.